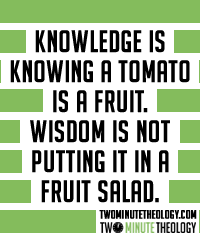 Taken completely at face value, it’s a pretty funny statement, it redily brings to mind the idea of sitting down to enjoy a fruit salad full of grapes, strawberries, apples… and tomatoes. How awful would that be? You’d certainly assume the creator of that salad was, at the very least, unwise. It’s often said that “those who don’t know history are doomed to repeat it.” This is a wonderful statement, but I’d like to expand it a little bit here for a moment. Just because a person is aware of something doesn’t mean that he is going to act on that awareness, therefore it may be more accurate to rephrase the old adage as such: “He who doesn’t know history is doomed to repeat it; he that knows it and lacks wisdom, even more so.” Wisdom is the ability to act on the knowledge that you have. The Bible provides wise counsel for many situations, and simply being well versed in it’s writings is often enough to know how to deal with situations as they arise – God has provided us with a pretty good instruction manual to live in his Word. Reading and studying the collective writings of generations of God’s people as they listened to Him, learned from their wrongs and dealt with enemies thousands of times more powerful than they, is about the best way to know what God would consider wise, and we also know that He provides wisdom to us directly. It is wise to study that which is given us to make us wise. Be careful, though, that you do not simply read for the sake of knowledge. Knowledge is a powerful tool, but it’s completely useless without the wisdom to wield it, and even more dangerously, being full of knowledge without wisdom can lead to arrogance and pride.